Hey Handsome opened to much praise in 2016 but Chef Nicco and Chef Queenie has constantly changed the menu to keep the diners excited with every visit. Here was my recent visit to try out some of their new dishes. 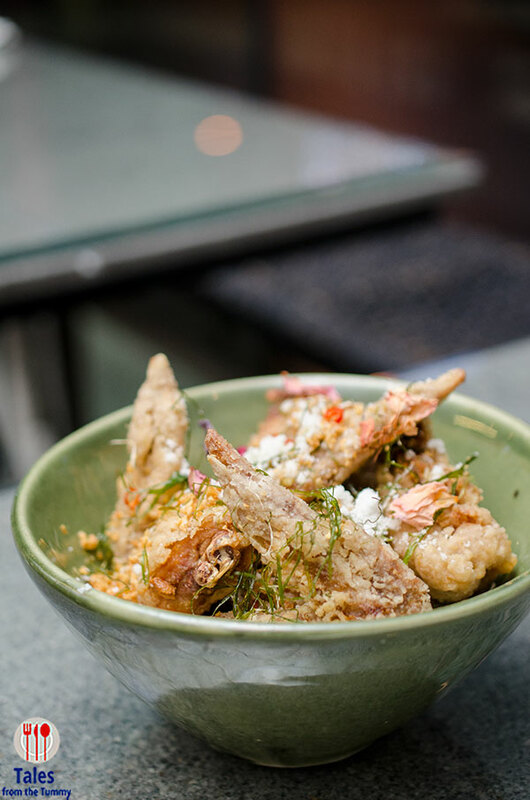 Chicken Wings (P250) with fermented tofu and kaffir lime. We started with this small plate of perfectly fried chicken wings while waiting for our dining companions to arrive. It’s easily shareable and deliciously crispy outer shell with no hint of oiliness. The meat is juicy while the flavor is tasty and familiar yet different at the same time because of the kaffir and the fermented tofu. 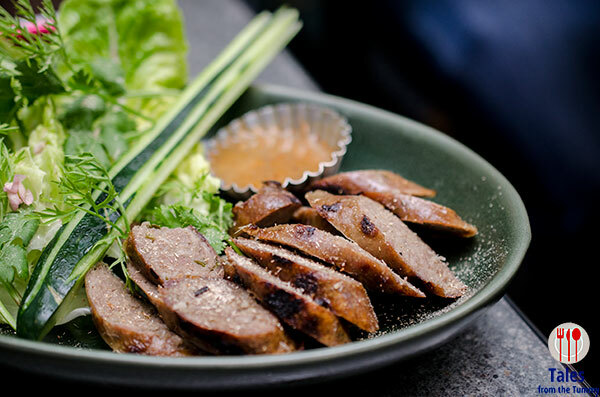 Smoked Duck Sausage (P320) with cucumber and jaew. Irene and I both loved duck a lot and were drawn to the unusual duck sausage on the menu. The sausage had a good balance of fat and meat and an enticing smokiness to each piece. The best way to eat this is get a bit of the green, and a sliver of cucumber then add a piece or two of sausage plus a little bit of the jaew (Thai chili sauce) if you want a kick of spice. I got the Cherry Pop (P150), lemonade with rosemary and cherry. 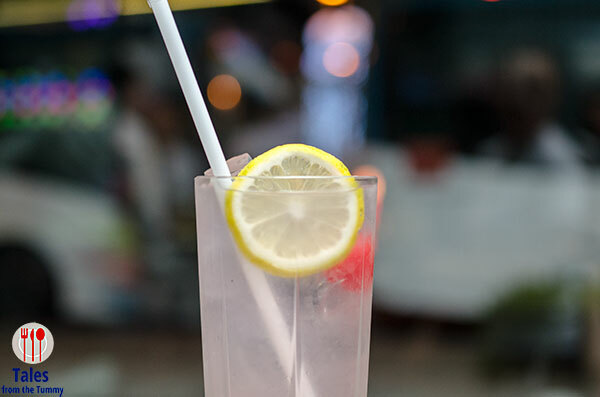 It was very refreshing and perfect to wash away the strong flavors of the dishes. 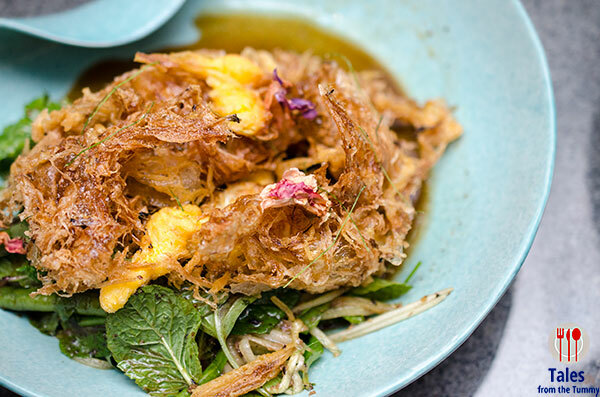 Our last appetizer was the Fried Egg Salad (P240) with lap cheong, herbs and Thai chili. The Chinese sausage plays a good meaty foil against the alternating crisps of the fried egg and the fragrant herbs. I suggest fishing out the Thai chilies or ask them to omit it else you get a not so nice surprise when you bite into one. Beef Stir Fry (P380) with baby carrots, fried egg and served with rich rice. 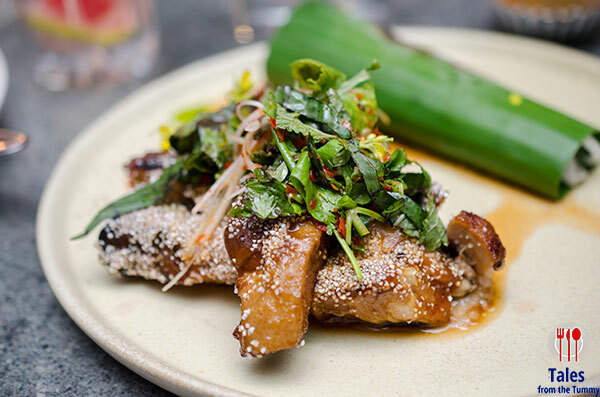 The Hey Handsome menu contains a fair amount of unusual dishes so if you are playing it safe this would be a good choice or the chicken with scallion and ginger. Rice is perfect for this dish as the stir fry sauces is perfect spooned on top while munching on the sweet baby corn and the tender beef pieces while the fried egg gives it a nice crunch. BBQ Beef Ribs (P280/100 grams) with tamarind, herbs and Thai chili. 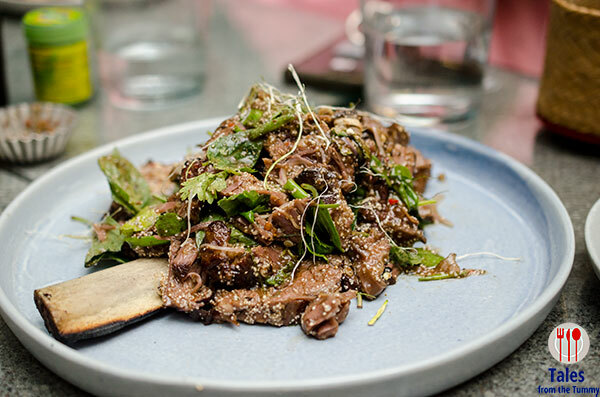 The beef rib is grilled and sliced when it arrives on your table, tossed in the herbs and spices. I.m not really a big fan of beef ribs, I lean more towards pork ribs but this one ranks up there. 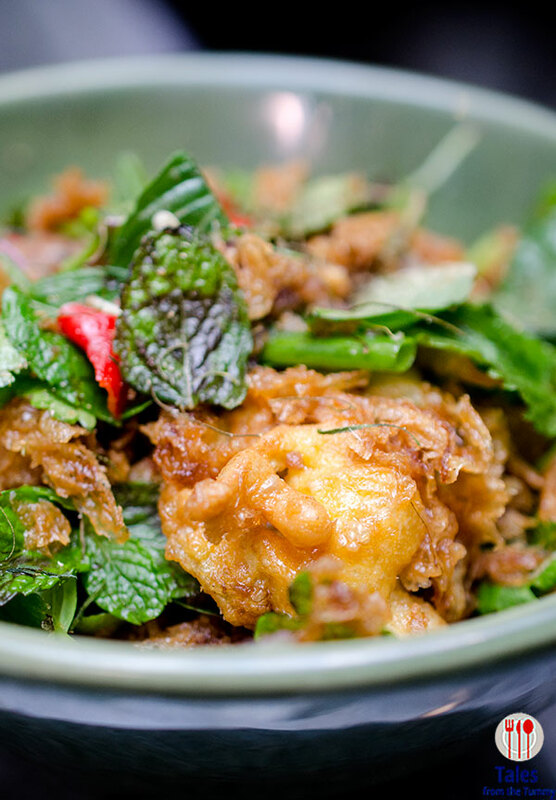 The fragrant herbs gives the dish an enticing aroma even before putting a piece in your mouth. Once you try the tender, smokey and well seasoned beef, you’ll be raising your hands to get some rice for sure. Only drawback for me is this is meant for sharing because it’s fairly large. 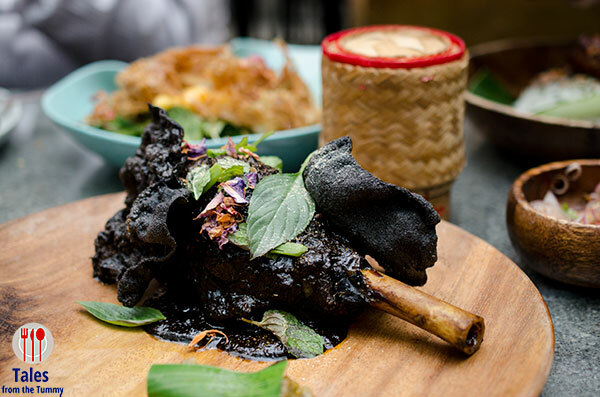 Braised Lamb Shank (P230/100g) with keluak and tempoyek. A whole lamb shank cooked in unique Malaysia spices. The tempoyek is made from fermented durian but I was surprised that it was not more pronounced in flavor. The meat itself was very tender while the flavors were something I’ve never had before. 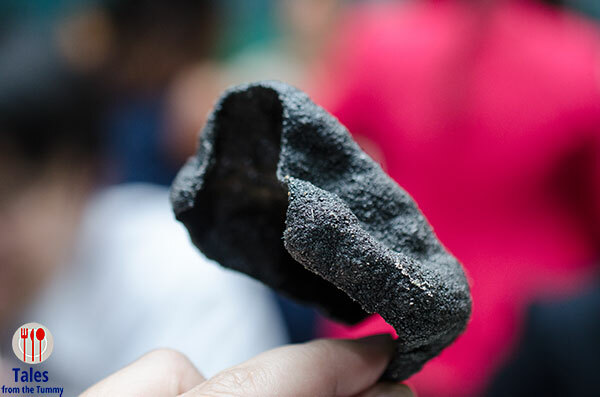 The squid ink kropek on the side were really good too so don’t miss them. Fried Duck (P770) with sambal matah and nasi ulam. 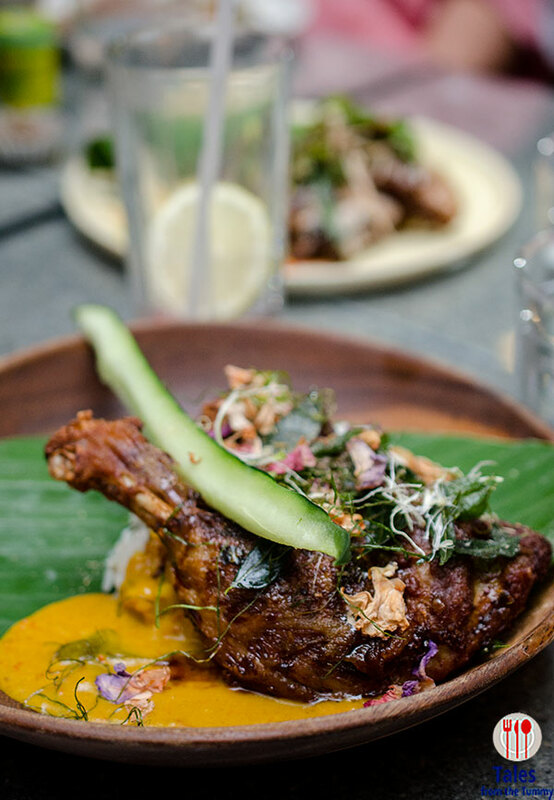 Indonesian style deep fried duck served with herb rice, spicy shallot relish and house gravy. Some have said this is similar to the famous fried duck in Bali but I’ve never had that so no comparison can be made by me. Eaten by itself without any add-ons, the duck was already excellent, tender and juicy. The herbed rice is a good partner for the aromatic and flavorful duck meat which you can amp up with some of the gravy. The relish is very spicy so a little caution before you go all out. Grilled Pork Belly (P665) with Thai chili, herbs and rich rice. The flavor profile of these ribs are similar to the one I had from their lunch menu but the flavors are more intense.